Remember this? Me too, dimly. 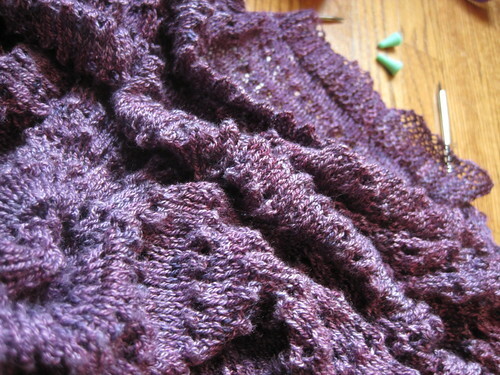 The Pi Shawl I started on back in the fall has lain dormant amongst the yarn stash and WIPs since about mid-November. I think I harboured some hopes of finishing it over the Christmas holidays, but then with other knits going on it became clear this project just needed some time to sit. I’d reached the part of the pattern where you’re knitting nearly 600 sts in the final section and just reached a stopping point. A week or so ago I took it back up and realized, as one often does after the Great Timeout of Projects That Were Sucking The Life Out Of You Before, that I wasn’t actually that far from finishing. This could actually get done. Of course, although the Pi Shawl is extremely versatile, the original instructions aren’t written for laceweight, and when you reach the final instruction of knitting the last section for 40 rows “or until tired,” there’s a fair amount of leeway for deciding when to stop. I’ve sort of been going with the technique of holding up the radius (it’s a big bunched up circle at this point) along my arm and judging if it’s reached my wingspan yet. I think it has. Which means I finally get to start on the edging. Because I’ve made a deal with myself that I can’t start one of the two (or three or four) sweater projects I’m itching to start on until I finish this shawl, you see. And, uh, just being left with a knitted-on garter stitch border on an almost-600-stitch circular shawl, that’s almost like being done, right? I think it looks lovely just the way it is. So, yes, it’s finished. Um, please don’t take this wrong, but all your projects always look so perfectly finished and a Pi Shawl is kind of plain looking, I for sure thought you would put something really lovely for the border. If you don’t feel like doing it, put it aside and do the sweater. I think down the road you’ll wish you put a more finished looking border on it after all the work you did, especially in lace weight, there are so many options. I’m sorry, but you asked so I’m telling you. No, I do not think that is a border fit for a Pi Shawl, especially not one knitted by someone as particular as you are about getting things just right. Please don’t hate me. It IS almost like being done! I’m glad you’re going to get it finished, and I can’t wait to see it! Thanks, Sue! Simplicity is actually my watchword on this project. 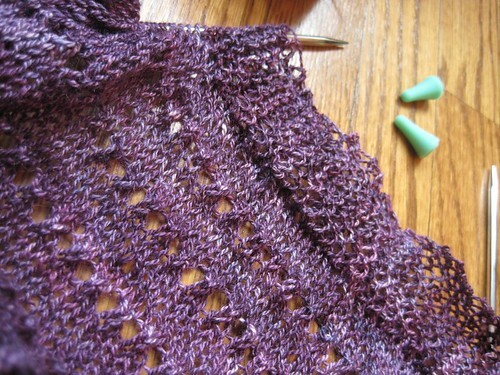 I purposefully avoided anything more complex than the yarnover rows on this shawl, because I wanted to keep it basic. Elizabeth instructs the most basic edging as a garter stitch one, and I’m going for it! I know that it will stretch out and flatten even more with blocking, so I’m comfortable letting the lacier finishing sit for another project. I am also making a pi shawl but in sock weight yarn and also in a dark blue. I decided to make it exactly as EZ describes. It is for an Elizabeth Zimmermann display our yarn shop is planning for the Fall. This has been a perfect project for picking up and setting down at will. I can work on it any time I need a something to keep my hands busy, like in a boring meeting or riding in the car. I will also make the plain edging to demonstrate her pattern faithfully. THEN, I will make another with a more complicated pattern and edging to show how versatile her patterns are. Your pictures inspire me to keep working, I am in the long stretch now. I think I have something like..3 projects on the go and fifty million waiting in the wings. May be a deal with myself is in order too! Alert to Glenna: This has nothing to do with the Pi Shawl. Was going back looking for your blog comments on Jaywalkers and noticed you were kind of muttering in the same blog about STR pooling in your 3×1 rib socks – you know what doesn’t pool in that pattern? Fleece Artist Trail Sock. I have almost my own full week’s worth of that wonderful combination.